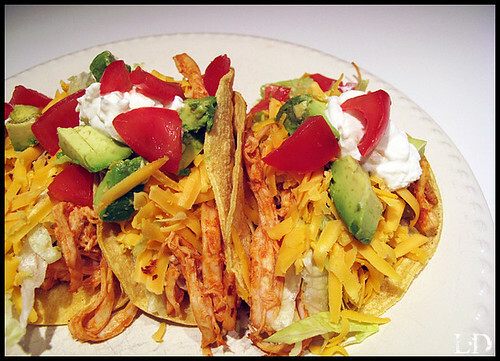 Here is a quick and yummy dinner for those busy weeknights that your family will love. Fresh and healthy Tex-Mex is very popular, and this recipe can be added to with other ingredient possibilities that suits your family. Debone your rotisserie chicken, then shred. In a bowl toss your chicken with the taco sauce. I use hot Ortega Taco Sauce, and I use the whole bottle. Set your chicken aside and prepare your other ingredients. Chop your lettuce, grate your cheese, chop your tomato, and avocados. In a non stick pan on medium high heat. Heat up your corn tortillas, flipping both sides. Place your corn tortillas in the microwave to keep them warm. Then add your chicken to the pan and cook just to heat up the chicken. Assemble your tacos and serve.